Breaking in half as it topples, the towering Plant Branch smokestack falls as planned within a special designated area. The third time was a charm for those planning the demolition of the Plant Harlee Branch smokestack. The scheduled toppling of the iconic, towering south Putnam County structure had been canceled twice by officials with Georgia Power, who still control the smokestack site. They first feared interference from Hurricane Matthew, which actually ended up following a track near coastal Georgia, rather than Middle Georgia. Then, just before the second scheduled time, they decided resources needed to perform the demolition would be better used helping out in areas that were affected by the hurricane. But Saturday’s toppling a little after 8 a.m. went on as scheduled. Scores of Putnam County residents gather near U.S. 441 and Lake Sinclair on the edge of a special restricted zone to watch the demolition of the Georgia Power smokestack on Saturday. As hundreds of curious onlookers gathered at the edges of an “exclusion zone” set up to restrict access to the area during the toppling, Controlled Demolition Incorporated workers used explosives to bring down the brick and steel structure, which fell in a westerly direction back onto Georgia Power’s Plant Branch property. The detonation of the explosives lasted less than one second, and sounded like a medium to loud thunder clap that could reportedly be heard more than a mile away. 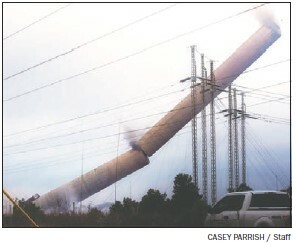 The smokestack cracked in half as it fell, releasing dust from its tip and disappearing into giant clouds of dust and mist as it hit the earth. After it toppled, special sprayers showered the debris with water to keep debris dust from blowing from the site. Residents may contact Georgia Power’s Regina Linch at 706- 484-7206 with any questions regarding dust. The 1,001-foot tall Plant Branch smokestack is partially obscured by clouds on the morning of its destruction. 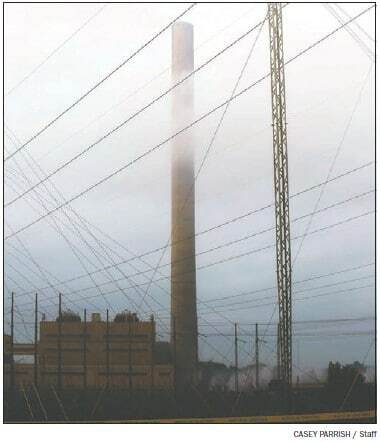 The 1,001-foot-tall, lone, remaining smokestack for the now-shuttered coal-fired electricity-generating plant was erected in 1978 and was described as the 42nd tallest chimney- smokestack in the world, according to a Wikipedia listing. It served as a handy landmark for folks trying to find their way around south Putnam. Plant Branch opened in 1965 and closed in early 2015 because it became financially unfeasible to meet newer, more stringent coal-burning emissions standards, officials said at the time. 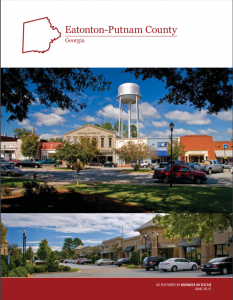 Putnam County officials had discussed turning the site into a lakefront park, but Georgia Power officials earlier this year announced that it was needed to consolidate and permanently store tons of coal ash left over from the plant’s earlier operations.